Don't you just think this is one very beautiful girl? She adorns an antique French postcard. I did show her earlier, together with other thrifty finds, which you can find HERE. 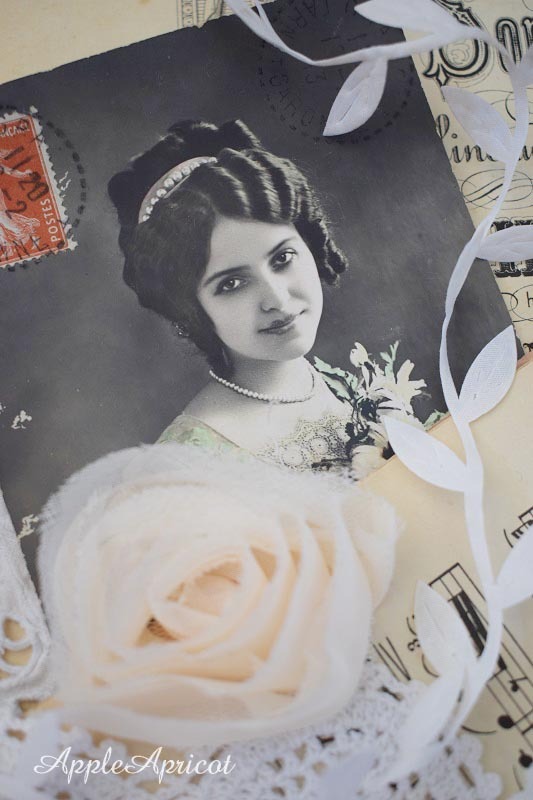 The image of another beautiful vintage lady was used by Marie of Lost Bird Studio in this gorgeous fabric collage below. Marie hasn't decided yet if it will become a card or a book cover. Either way, it is so gorgeous, Marie! 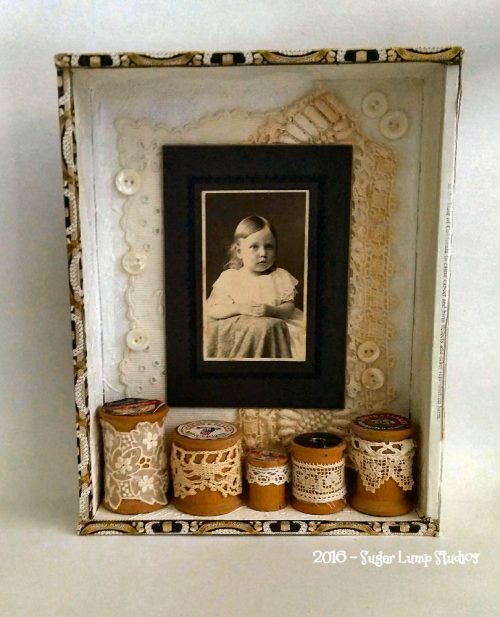 I am totally in love with those beautiful vintage spools with lace! Thank you so much for your generosity, Nicola! What neutral coloured beauty did you find or make or buy or receive? be it cream, white, grey, beige, silver and/or brown. A creation you made or received, home decoration, a statue or architecture, or anything out there that you were allowed to take a photo of. 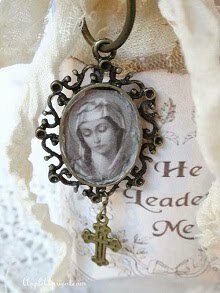 It's always a delight to see what pretties are shared each time - love the French girl image too. What a lovely French lady! I am honored you included my spool cigar box among the beautiful contributers art. I look forward to the challenge of Simply Neutrals both in creating art, taking the photos, and blogging/visiting. It is a good incentive as I have said to get me moving! thanks Wen!!! So beautiful she is dear Wen, and with the lovely rose and vine, it looks just like you started telling a love story . Dear Marie, and dear Nancy are both among my favorite artist and blogging friensd, I admire both their art . 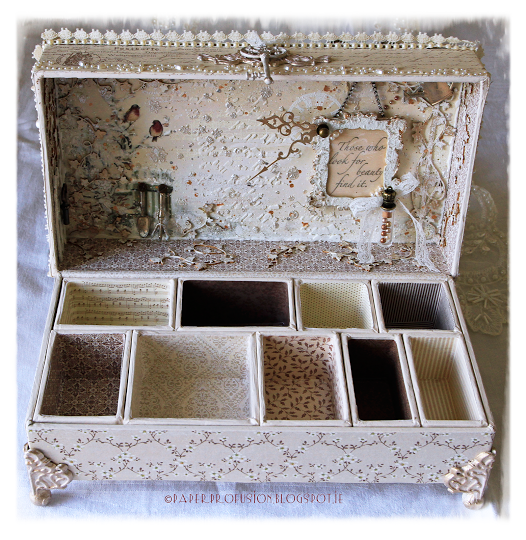 And oh Nicola, is creating such stunning things, I`m lucky to follow her blog !! Sweetie Wen, It seems I can`t make the link to your blog, and to my own here on the mr. linky, work...both on my own blog and yours it will not !!!!! Have a lovely evening my dear friend. Thank you, dear Wen, I tried a lot of times, without any succes, so lovely of you to do it for me. Wen I`m off t stay with my daughter and grandkids for 5 days, so there will be no answers to you, for the first coming week, I hope it is ok, sweetie, as you said, to take it easy. 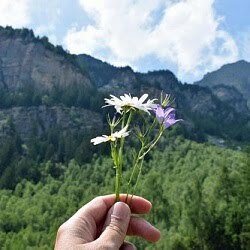 I wish you a happy Pentecost and a wonderful weekend, dear. That is a beautiful image, love the flower and the leafy vine with it too :) Gorgeous projects from all the girls, always love the look of lace on the spools and the box is amazing! Such beautiful samples from everyone! So dreamy really! She certainly is a real beauty Wen, and would make any piece a joy to look at don't you think? All those featured projects are just so pretty and inspiring. The 3 ladies have done some wonderful work indeed!